FUNcube Dongle PRO is an USB stick, containing a great SDR at a low price of around 200 Euros. It makes a fine choice if you are seeking a serious start into the world of HF & SDRs. I had much fun in gettingout the most of it regarding the HF bands. My enthusiastic experience resulted in this paper: 16 pages with 43 figures showing how to use this great little SDR in receiving, decoding and analyzing. Many aspects are covered, with broadcast, Amateur Radio and Utility DXing only some of them. 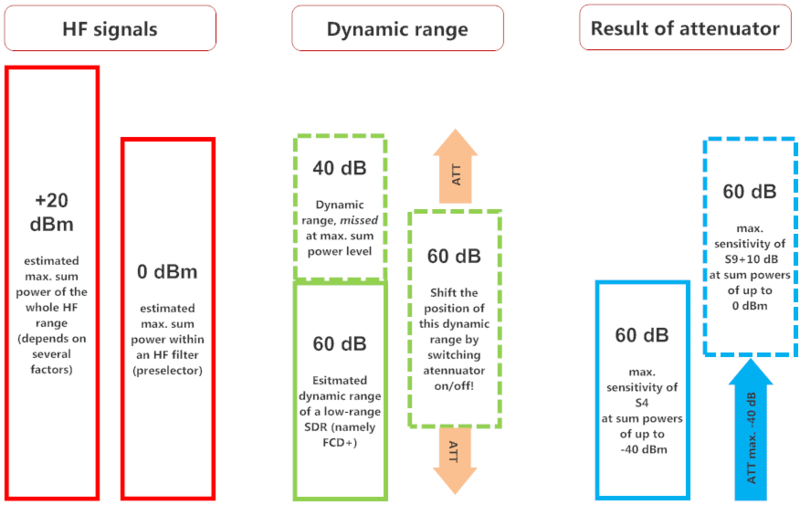 The key success factor in the congested HF bands is shifting the quite limited dynamic range to it’s proper place (see Illustration from the paper on top). This simple technique results in stunning reception of even Decoding delicate digital signals of 2.400 baud out of Tahiti in Germany! This paper explains in detail on how to get the most out of this receiver.